Houses & Homes VA: A Budget Makeover for Your Home that Anybody Can Afford! A Budget Makeover for Your Home that Anybody Can Afford! There are many ways to improve the appearance of your home and some of them don’t cost a thing. Many times you already have everything you need to add some character to your home and just a bit of imagination is all it will take. Your Furniture is NOT Nailed Down! I admit it’s a bit of a cliché but the truth is that rearranging your furniture can make a huge difference in the appearance of your home. If you have chairs and sofas pushed up against the walls why not try to move them out into the room for a very different “feel” to the room? This will create a cozy sitting area and is very inviting for guests and even family after that Sunday dinner. If the room is small you can give it a more spacious feeling by extending the length of the curtains and allowing them to hang freely. You already know that art can be an expensive proposition but you don’t need to break the bank to decorate your home. A nice way to add some flair to your kitchen is to hang pots, pans etc. on the walls. This can look really nice if you do it right and even attractive pot holders can look great on wall hooks. An added benefit is that cooking’s a breeze when everything is so easy to find and you gain more storage space for other items. EVERY kitchen needs a little more space, right? A hallway can turn into a virtual family who’s who with the right picture frames and even colorful fruit in jars are beautiful as accents in the dining room! As I said, imagination is the key here and as you can see the possibilities are endless. One of the best ways to change the entire feel of a room is as simple and affordable as painting the walls. 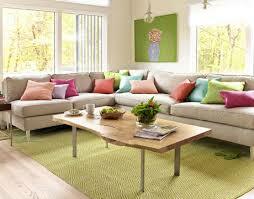 In fact, even changing the color of one wall in a room will create an entirely different atmosphere. And remember, magicians aren’t the only people that can benefit from mirrors! A mirror will make a room look much larger than it really is and can even add some light to brighten the mood. What about several small mirrors in a decorative pattern on a wall? You’ve heard it said that the “devil’s in the details”? Well, so is the secret to a beautiful home! Accents are very important and can add that warm and cozy look to any home. Remember all of those Xmas cards from last year – why not lay them out on a decorative plate or bowl? You can put a small runner around that little table in the corner to make it a more attractive and pillows on chairs and tables add diversity. The ideas go on forever but a little change here and there will make a world of difference and give your home a professional looking makeover that everyone will notice.